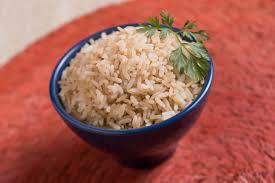 In China, people started to farm and eat rice in the Stone Age, about 8000 BC. You probably eat a lot of rice too, but do you know how to cook rice for yourself? Try these rice-cooking projects and get to understand rice better. But everyone’s got their own way to cook rice. In France and Italy, most people just add a lot of water to the pan, as if they were making noodles, and then they drain off the extra when the rice is soft. In China, people often cook rice for a long time in a lot of water so that it turns into a soft porridge called jook. People eat it for breakfast, like oatmeal. It’s easy to make jook: just simmer a cup of rice in six cups of water with a cube of chicken bouillon for an hour, covered. Then add some minced ginger root, and maybe a little chopped bacon, and simmer for another hour. Add more water whenever you need to in order to keep the rice soupy like porridge. Serve the jook with chopped green onions and peanuts scattered on top. Cite this page: Carr, K.E. Rice-cooking project – Stone Age China. Quatr.us Study Guides, June 6, 2017. Web. April 19, 2019.